[PDF] Growing at the Speed of Life: A Year in the Life of My First Kitchen Garden | Free eBooks Download - EBOOKEE! Description: With more than two dozen cookbooks and hundreds of television shows, lectures, and personal appearances devoted to promoting healthful cooking, award-winning chef and former "Galloping Gourmet" Graham Kerr literally starts from the ground up in this engaging, inspiring, and highly informative introduction to the joys of the kitchen garden-and the pleasures of the table that start with growing your own food. While Kerr taps into the current trend of sustainability, eating locally and organically, and eschewing fast food, he recognizes that today's home cooks are savvier and more discerning than their predecessors in the back-to-the-land movement. And in this day of rampant obesity and related diseases, he understands how critical taking these vital steps toward wellness can be. Growing at the Speed of Life takes you through the first year in his kitchen garden, sharing the lessons learned and the wisdom received from his circle of local knowledge providers. From digging up his "south lawn" and putting together a greenhouse to planting his first seeds and harvesting and sharing his first crop with others in need, Kerr provides a whirlwind tour through his gardening adventures. Along the way, he profiles sixty common-and not-so-common but readily available-garden vegetables, fruits, and herbs with useful advice and recommendations for care and feeding. Once the harvest is done, Kerr takes you into the kitchen, offering guidance on the best cooking methods to create appealing dishes in his inimitable and spirited style. He includes more than one hundred recipes that are as simple and elegant as they are healthful-and that will certainly entice you to increase the amount of plant foods in your diet. 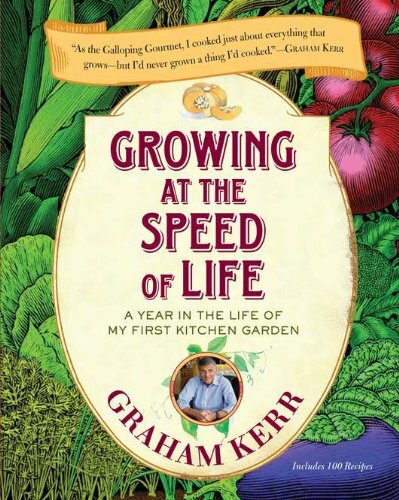 No comments for "[PDF] Growing at the Speed of Life: A Year in the Life of My First Kitchen Garden".